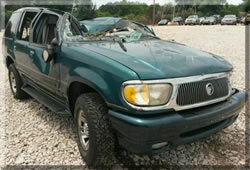 Mercury Mountaineer like the Ford Explorer has serious rollover problems. The Mercury Mountaineer is the upscale Explorer with more bells and whistles. For many years the Mercury Mountaineer was a popular SUV sold by Lincoln Mercury a division of Ford Motor Company. It was essentially a Ford Explorer with a more upscale interior and slightly exterior appearance as well. These upgrades added $1000 to $6000 to the Mercury Mountaineer's price over the Explorer. Mercury Mountaineer was unable to avoid the bad press regarding the rollover problem and the fact that many Mercury Mountaineer were fitted with the ill fated Firestone tires that were recalled due to tire tread failures, tread separations, de-treading, blowouts and other defects. In June 2010 Ford Motor Company decided to cease production of the Mercury brand, and in 2010 spelled the end of Mountaineer production. The Mercury Mountaineer fell from being the third-best selling vehicle of the Mercury division in 2000, to the worst selling one a mere ten years later. When it comes to rollovers of the Mercury Mountaineer vs. Ford Explorer, the hands down rollover king is the infamous Ford Explorer. Both vehicles share the same wheel width and short wheel base making them somewhat top heavy and rollover prone. The center of gravity of the Mercury Mountaineer is essentially the same as the Explorer, except additional weight of some of the options. The roof rack on these vehicles can also increase the center of gravity and make them to have a higher rollover propensity when the roof rack is loaded with suitcases and other heavy cargo. When a driver is faced with a sudden tire failure or blowout the high center of gravity becomes a serious handling issue in bringing the vehicle under control causing the driver to often over-steer, over correct and over brake sending the vehicle out of control. The Mercury Mountaineer and the Explorer both have the same weak roof pillar design and as such both have the same roof problems of collapsing and crushing down onto the occupants during a rollover crash, especially when at highway speeds. The roof supports also known as pillars are labeled from the front to the back. The A-pillar is the roof support between the front door and the front windshield. In a rollover, the A pillar often buckles under pressure and bends or folds down allowing the rest of the roofs integrity to be compromised and weakened. In some roof crush collapse accidents, the middle of the roof with crush in and in others the roof with point up in a cathedral crush pattern. When the A & B pillar on the same side collapse, that side of the roof can flatten out easily, crushing and trapping the occupants causing severe head injuries, spinal cord injuries, paralysis and death. In drop tests conducted, we have shown that many of these roofs will not even withstand an 18" vertical drop without extreme deformation of the roof. Stronger and thicker metals are needed and space fillers inside the column are needed to prevent such bending and intrusion into the safety space of the occupants. 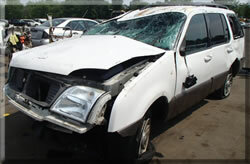 Sadly Mercury Mountaineer and Explorer owners are never aware of the weak roof system until it is too late.